This summer I grew Feverfew for the first time, in a pot with Mexican Oregano and Dusty Miler. It grew well, and tolerated frequent harvest of its flowers and leaves for tincturing, sprouting new buds and growth many times. I hope it comes up next year so I can enjoy it all over again. Feverfew had always confused me. I rarely heard it used for any other use besides migraines, and since I rarely experience migraines or headaches myself or treat many headaches, I didn’t gain experience with it. It seems that there were differing opinion about it. Some said it was only good for headaches with specific indications, some said to take it as a prophylaxis daily for any sort of migraine. Some said it was overrated and some said it was highly reliable. Reading through my herb books, my confusion has been reaffirmed, which I will discuss in a later post. Yesterday evening, hours after writing the first draft of the post about Feverfew, I had headache. Oh, the irony. I shlepped around like a zombie for a few hours before realizing I could probably do something about it with herbs and acupressure. I can’t believe it took me that long to treat myself, but apparently headaches can do that to you. I dug around in my herbs awhile, not feeling drawn to anything, then I pulled out the Feverfew tincture. 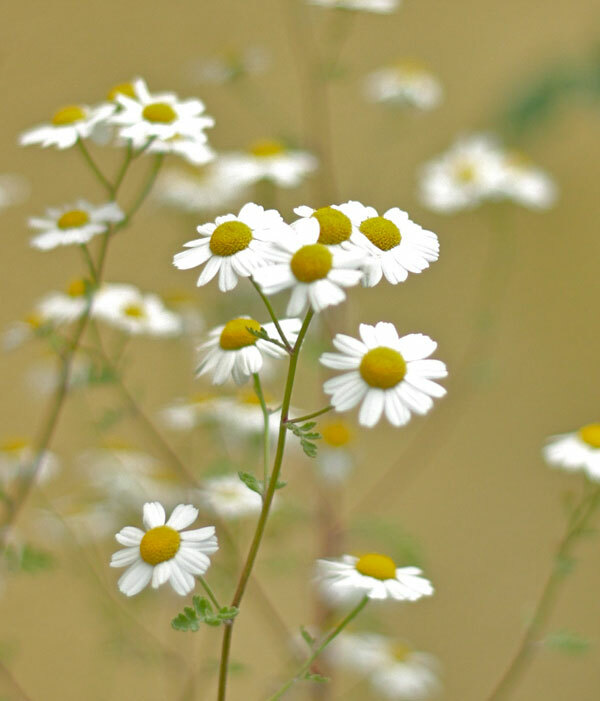 In my research, had learned that Feverfew is a cool, bitter herb (though some say it’s warm) which clears Liver wind and wind-heat and calms hyperactive Liver Yang to treat headaches related to these patterns. Liver and Gallbladder are Wood elements in Chinese medicine. Trees and plant life grow in all directions but have a predominance to grow up, and thus excess or unanchored activity in these organs can cause Yang or wind to flare upwards to the head, eyes (Liver), back of the neck and ears (Gallbladder). My symptoms seemed to match the indications well-enough, so I tired 30 drops of Feverfew in water. I suppose I could’ve done a higher dose, but that was what I was drawn to. I also suppose that this wasn’t the perfect herb that I could’ve taken, but I felt more excited to try Feverfew since I was studying it than anything else. The tincture tasted surprisingly good, somewhat sweet and very fresh and green, almost like chamomile. The bitterness was understated. After that I did acupressure locally and sinew channel releases on distal Gallbladder, Liver and Stomach meridians on the feet and ankles, which provided relief. The headache was 90% cleared after 30 minuets. The irony continues, because in 2008 I wrote a post about herbs for headaches I also came down with a headache at that time, after not having one for years and years. That one responded well to relaxing nervines like lobelia, and the formula I used was based on Kloss’s antispasmodic formula. Acupressure worked well then, too. On a side note, working the feet with acupressure, massage, or a foot bath is quite effective at redirecting the excess build-up on pain and inflammation in the head downwards. In fact, I love foot baths for head colds, delayed labor, anxiety or over-thinking and insomnia. 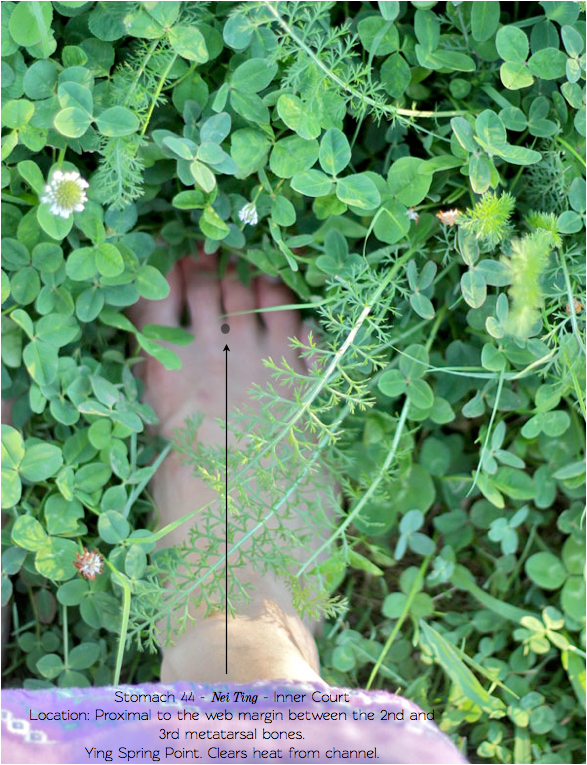 Just walking outside barefoot or standing in the grass can feel significantly grounding. Stomach 44 on the lateral web of the 2nd toe was the epicenter of it all, very tender and reactive. This points’ strong activity confirmed my pattern diagnosis of food stagnation and heat of the Stomach causing Liver/Gallbladder disharmony. When food is the trigger and digestion is thus impaired, the Earth organs are involved. Earth is controlled by Wood, much like the way plant roots abate erosion. If Earth is in a state of excess like when there is stagnation,it can be transferred to Wood by the nature of their interrelatedness. Please note that this is just one of a many dynamics happening between Earth and Wood, more specifically Stomach and Liver. My headache was dull and throbbing and had a dispersing, moving quality to it, which can be seen as Liver wind. It was hard to pinpoint the exact location, but the temples, vertex, eyes, ears and hairline were all involved, and I had significant lingering tension in upper trapezius, which are all indicated with the Liver and Gallbladder channels. My pulse was more wiry, strong and rapid then normal, with the right Guan (the Spleen and Stomach pulse) of the pulse was wiry and slippery on the surface and weak at a deep level, which further confirmed disharmony. My face throbbed and felt hot by my chin as well, right on the Stomach channel. The next day I broke out with a red pimple below Stomach 4. And the headache worsened with eating and drinking. The culprit? Earlier that afternoon I went to a workshop and ate a thin slice of homemade grapefruit rosemary cake and and half of a lemon poppy seed cupcake. For most people this wouldn’t be a big deal at all, but I have a hard time digesting wheat, especially when it is combined with sugar. This I know. And know well. But the cake sounded really good. Grapefruit and rosemary?! Yum. Winning combination. I enjoyed every minuet of it. The headache came on within 10 minuets. Seems like a pretty solid indication yet again that wheat is not my friend at the moment. Or for the last 6 years or longer, actually. Although when I can eat it in Italy…hmm…[insert mind spinning about the degradation of our food supply, industrial farming, Monsanto, epigenetics, SAD (the standard American diet), the relationship between the health of our soil and the health of our microbiota doing the bulk of our digestion, absorption and immune modulation…]. Food intolerances can lead to all sorts of out-of-whackness (a technical term, can’t you tell) all over, in both acute an chronic situations. Having fresh Feverfew tincture around has prompted experimentation in way I didn’t do in the past. I found myself using it premenstrually and during menstruation as an anti-inflammatory and prostaglandin reducer and to move stagnant Qi and Blood, which seemed to work. Over the last year of graduate school, I read a lot of research studies about dysmenorrhea and it’s inflammatory style. Someday I’ll hopefully organize a post about it, because it was quite interesting and changed my treatment strategy for menstrual disorders. As soon as the cramps are done, like on day 2 or 3 of the cycle, the researchers found that the inflammatory modulators which cause pain were already being set in motion to do it all over again some 26 days later. When I was reading these studies, we were learning about headaches yet again in Western Clinical Diagnosis class and I saw some overlap between migraines and menstrual cramps. Inflammation is inflammation, prostaglandins are pervasive. I know in older European herbals Feverfew was used for menstrual disorders. Like I already mentioned, I am writing more about Feverfew in another post. Researched posts take me a long time, days and days sometimes. Hopefully it will be up soon! Have a great Thanksgiving! And note to self: lay off the pumpkin pie.